Beauty of interest: Shu Uemura NEW Glitter Eye collection for summer 2012! Shu Uemura NEW Glitter Eye collection for summer 2012! Ok I know I have been neglecting this blog for awhile and I do apologlize for that. But I promise you there will be lots of reviews and comparisons in the near future so stay tuned for sure. 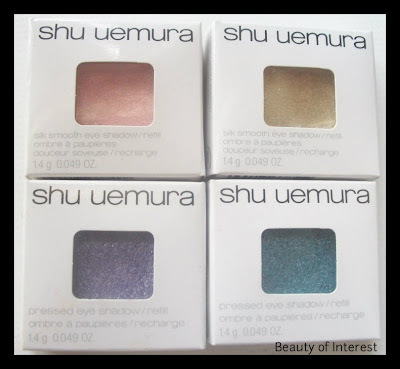 One of the items I got a few months back were the new Shu Uemura eye glitter from the Glitter Eye collections for summer 2012. 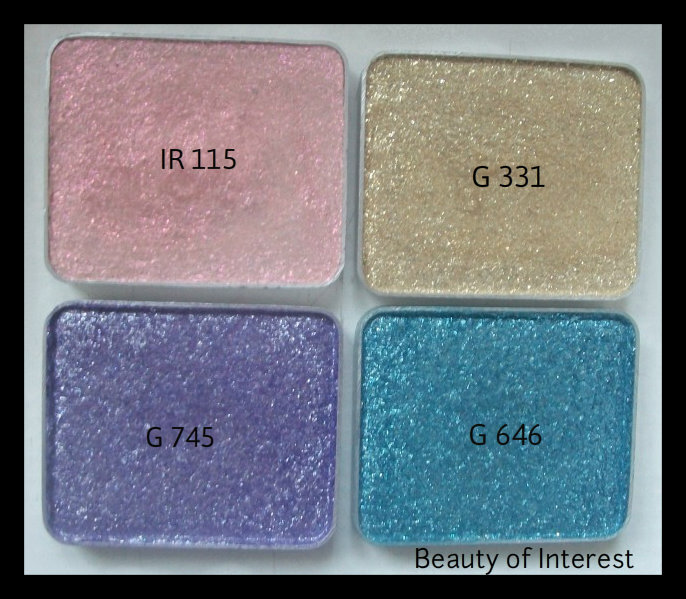 These new eyeshadows are glitters as their names already gave away. The glitters are very sheer compared to the regular eyeshadows from Shu Uemura and can be applied over a regular eyeshadow to give it more dimension and complexity to a otherwise 'boring' eyeshadow. The IR 115 is a beautiful soft pink shade with subtle hints of golden glitters in it. This shade would look gorgeous over a regular brown or taupe eyeshadow color. This color is part of the range that is called 'SILK SMOOTH EYESHADOW' and is described as 'a brand new innovative silky texture with long-lasting sparkles'. The G 331 is a pretty white gold color and it's the sheerest of the 4 I have purchased. If you're looking for more brighter colors, the G 744 is a gorgeous purple shade and will add an extra oompf to any eyeshadow color you're wearing. And last but not least, the teal shade that is called G 646 is probably my favorite of the 4 I got. It gives the right amount of 'pop' to your eye look without being too over the top or in your face. The texture is very smooth and easy to work with. These glitters can be applied with fingers or a brush (I prefer a brush though) and I have experienced zero fall out from these glitters. Bear in mind I do always use a primer when I put on eyeshadow so that could be the reason as well. I took the liberty to do some swatches as well for those who are curious how it looks like. 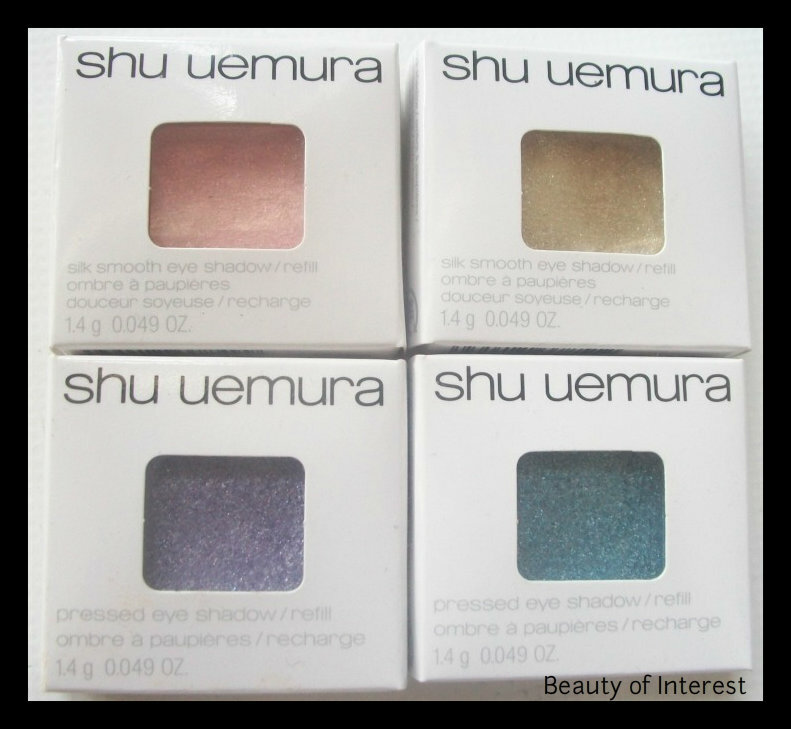 If you're a fan of glitter or sparkly eyeshadows, I highly suggest to check these out at your nearest Shu Uemura counter. Shu Uemura Glitter Eye Collection For Summer 2012 is readily available at all Shu Uemura locations.